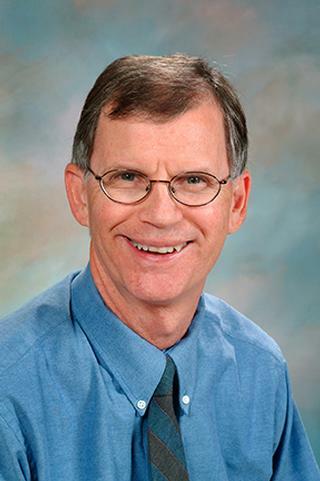 John C. Grable, M.D., Ph.D.
Dr. Grable is Associate Professor at URMC. After serving in the U.S. Army, he received his Ph.D. in Biology and M.D. degree from the University of Pittsburgh. Dr. Grable then completed his Internal Medicine Residency at URMC. He is an Assistant Program Director for the residency program and performs tobacco cessation research. Prucha, M.; Fisher, S.; Mcintosh, S.; Grable, J.; Holderness, H.; Thevenet-Morrison, K., Quinones de Monegro, Z.; Sanchez, J; Bautista, A.; Diaz, S. and Ossip, D. "Health Care Workers' Knowledge, Attitudes and Practices on Tobacco Use in Economically Disadvantaged Dominican Republic Communities". Int. J. Environ. Res. Public Health 2015, 12, 4060-4075. 2015; . Grable JC, Ternullo S. "Smoking cessation from office to bedside. An evidence-based, practical approach." Postgraduate medicine.. 2003 Aug 0; 114(2):45-8, 51-4. Kim YC, Grable JC, Love R, Greene PJ, Rosenberg JM. "Refinement of Eco RI endonuclease crystal structure: a revised protein chain tracing." Science.. 1990 Sep 14; 249(4974):1307-9. Chapter Title: "The Structure and Function of the EcoRI Restriction Endonuclease"
Author List: Rosenberg, J.M. ; McClarin, J.A. ; Frederick, C.A. ; Grable, J.; Boyer, H.W. ; Greene, P.
Chapter Title: "The Structure and Function of EcoRI Endonuclease"
Author List: Rosenberg, J.M. ; McClarin, J.A. ; Frederick, C.A. ; Wang, B.C. ; Boyer, H.W. ; Grable, J.; Greene, P.
Chapter Title: Development of Protein Design Strategy for EcoRI Endonuclease"
Author List: Rosenberg, J.M. ; Wang, B.C. ; Frederick, C.A. ; Reich, N.; Boyer, H.W. ; Greene, P.; Grable, J.; McClarin, J.A. Edited By: Oxender, D., and Fox, F., eds.